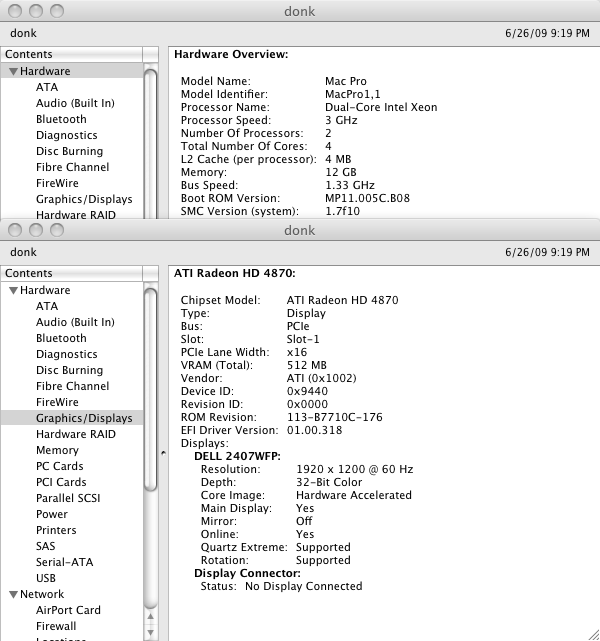 I’ve got an iStorage Pro 8 bay filled with 2 GB drives, and an ATTO R380 running on my 2009 Mac Pro in a RAID5 config (I have since realized that I should be using RAID6 for the more favorable reliability / performance tradeoff), and like many of you I’m eagerly awaiting the new mac pro. I’ve been researching various storage options, and would like to offer these options up for comment and criticism from the group. I see three general approaches for moving to a thunderbolt-based mac, two of which retain my existing enclosure and storage: 1) External Thunderbolt –> PCI chassis to house my R380, such as perhaps the mLogic mLink, keeping the iStorage Pro, or 2) Retire the R380 and replace it with something like the ATTO ThunderStream SC 3808D, which provides two SAS ports and operates at 6 Gb, still keeping the iStorage Pro, or 3) get an entirely new thunderbolt RAID + enclosure + disks, which would probably offer a performance boost (that I don’t *really* need). 1) I confirmed with ATTO and mLogic that the R380 with the newest drivers (4.0.1) is supported in thunderbolt topologies. An mLogic mLink is fairly inexpensive at about $400, and provides a single PCI slot that seems like it should be fast enough to let the R380 top out. However, I’m slightly concerned about inserting an additional device between the host and the platters; should I expect a significant latency / throughput hit as a result? This option is probably the least flexible and has the shortest useful lifespan of the three, but is also the cheapest by far. 2) An ATTO ThunderStream SC 3808D is more than twice the cost of an mLink at about $1000, and would replace the R380 and operate at 6 Gb instead of 3 Gb. This also leaves the door open for future SAS expansion via daisy chaining. I have no problem leaning on something like a ThunderStream for as long as it’s viable to do so, provided it’s reliable and performant enough. 3) Get a new thunderbolt RAID enclosure including new drives. At first I thought this was vastly more expensive than a SAS-connected solution, but maybe it’s not… To compare: on the one hand we have $3600 for a 3 TB Pegasus2 R8, and on the other hand, $1000 (ThunderStream SC 3808D) + $1400 (another iStorage T8 SAS enclosure) + ~$1200 (8 x 3 GB drives) = $3600. As the price is roughly a wash, going with the newer, faster solution with fewer discrete components is a no-brainer. There is also the fact that my existing drives have all just crossed the 3 year mark – no problems yet, but… check out the data from Backblaze that shows a marked increase in HDD failure rate after 3 years. Yet another reason for me to get a new enclosure + drives: I don’t have enough capacity elsewhere to back up or offload the 7.2 TB of data I currently have (like I said, enthusiast ;), which is somewhat unsettling given that it’s RAID5 and not RAID6. So, those are the options I’ve been considering. Having written it all out, I think I’m leaning towards biting the bullet on a Pegasus2 24 TB R8, however I’d greatly appreciate any comments / pot-shots / hazing from the crowd.